Barbaras “The Boss Baby” Movie Sweepstakes & IWG – Win a hometown screening! 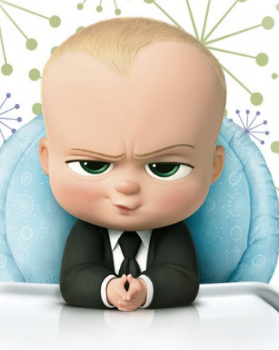 Win a hometown screening of “The Boss Baby”! ENTER SWEEPSTAKES HERE – Barbaras Sweepstakes page. ENTRY LIMIT – Limit of one entry/game play per person per week. ELIGIBILITY – Open only to legal residents of the 50 U.S. & D.C., 18+. SWEEPSTAKES ENTRY PERIOD – Sweepstakes and Instant Win begins at 9:00 AM PT on 1/2/17 and ends at 9:00 PM PT on 7/31/17. PRIZES – Sweepstakes Prize (1): Hometown Screening. ARV: $1,500. Instant Win Prizes (1,200) Fandango Promotional Codes. Fandango Promotional Code is good towards 2 movie tickets ($9 per ticket, up to $18 total ticket and convenience fee value) to see The Boss Baby or any other movie at participating theaters in the U.S. Fandango Promotional Code is not for resale, and is void if sold or exchanged. Fandango Promotional Code must be redeemed by 8/31/17 and is valid for one-time use only. 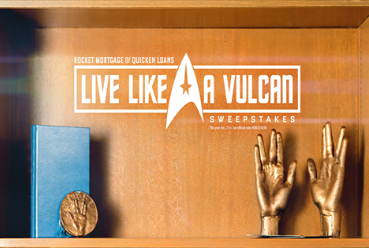 Quicken Loans Live Like A Vulcan Sweepstakes – Win a trip to the premiere of Star Trek Beyond! Win a trip to the premiere of “Star Trek Beyond”! ENTRY LIMIT – Limit: One (1) Standard Entry and twenty-three (23) extra Sweepstakes entries per person/email address/Drawing during the entire Promotion Period. 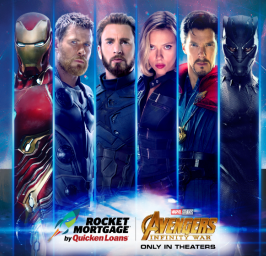 ELIGIBILITY – The Quicken Loans Live Like A Vulcan Sweepstakes is open to legal residents of the fifty (50) United States and the District of Columbia, who are 21 years of age or older, all at the time of entry. SWEEPSTAKES ENTRY PERIOD – The Promotion begins June 28, 2016 at 8:00:00 p.m. Eastern Daylight Time (“EDT”) and ends August 27, 2016 at 12:00:00 p.m. EDT. Check for Use Towards Mortgage for a Year Drawing: One (1) verified Check for Use Towards Mortgage for a Year Drawing winner will receive $12,000, awarded in the form of a check made payable to the winner, which winner may use towards payment of his/her home mortgage payments for a year, if any. Twenty (20) winners will receive one (1) Star Trek Beyond Movie Fat Head Poster. ARV: $79.99. Instant Win Game Prizes: 2,000 Instant Win Game winners will each receive one (1) reward code valid for a movie certificate good for one admission (up to $13 total value) to see “Star Trek Beyond” at participating theaters in the US. Reward code is redeemable at: https://www.activaterewards.com/paramount/. Winners will receive a reward code that is displayed on screen and delivered to the email address provided during registration for the sweepstakes. Instant Ticket Prize Winner reward codes will not be reissued in the event that the originally provided reward code is lost, stolen, invalid, or missing. Movie Certificate Terms and Conditions: Movie certificate is good towards one admission (ARV: up to $13 total value) to see Star Trek Beyond at participating theaters in the U.S. Reward code void if not activated by 9/22/16, and certificate void if not used by 9/22/16. 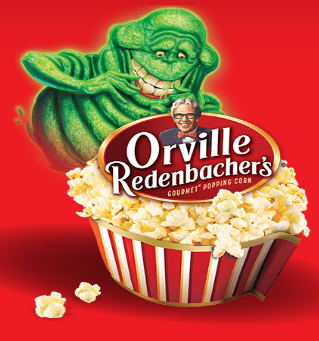 Orville Redenbacher’s + Ghostbusters Instant Win & Sweepstakes – Win a Sony 4K Ultra HD TV & more! Win a Sony 4K Ultra HD TV, a Sony Soundbar, a popcorn cart & more! ENTER SWEEPSTAKES HERE – Orville Redenbacher’s Sweepstakes page. ENTRY LIMIT – There is a limit of one (1) Game Play per person per day during the Promotion Period. ELIGIBILITY – This Promotion is offered only to legal residents of the fifty (50) U.S. States and the District of Columbia who are eighteen (18) years and older at the time of entry. SWEEPSTAKES ENTRY PERIOD – The Promotion begins on June 8, 2016, at 12:00 PM (noon) Eastern Time (“ET”) and ends on November 6, 2016, at 11:59:59 PM ET. 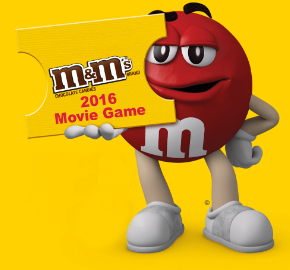 M&M’S® Brand Movie Instant Win Game – Win a pair of movie tickets! Win a Movie Certificate for two movie admissions (1,315 winners)! ENTER SWEEPSTAKES HERE – Text “MOVIE” to 87654 (fees apply). ENTRY LIMIT – LIMIT: ONE (1) TEXT MESSAGE PLAY PER EMAIL ADDRESS PER CALENDAR DAY. ELIGIBILITY – This M&M’S® Brand Movie Game is open to individual legal residents of the 50 United States and Washington, D.C. who are age 13 or older as of date of participation. SWEEPSTAKES ENTRY PERIOD – Sweepstakes begins at Noon ET on June 13, 2016 and ends at 11:59:59 a.m. ET on August 22, 2016. PRIZES – 1,315 First Prizes: each, a Movie Certificate redeemable at a participating theater for two (2) movie admissions; Approximate Retail Value (ARV) of Each First Prize: $24. 5,497 Second Prizes: each, a Movie Certificate redeemable at a participating theater for one (1) movie admission; ARV: $12 each. 13,928 Third Prizes: each, a $5 Concession Certificate redeemable at a participating theater; ARV: $5 each. 143,846 Fourth Prizes: each, a $3 Concession Certificate redeemable at a participating theater; ARV: $3 each. 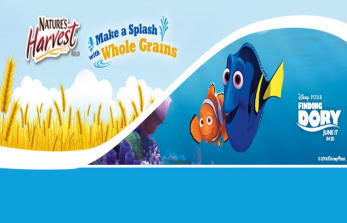 Nature’s Harvest Make a Splash with Whole Grains Sweepstakes – Win movie tickets & more! Win Fandango movie tickets & more! ENTER SWEEPSTAKES HERE – Nature’s Harvest Facebook page. ELIGIBILITY – Sweepstakes is open to legal residents of the fifty (50) United States and the District of Columbia who are 18 years of age or older (or the age of majority in their state of legal residence whichever is older) as of date of entry. SWEEPSTAKES ENTRY PERIOD – Make a Splash with Whole Grains Sweepstakes starts on April 28, 2016 at 12:00 p.m. Pacific Time (“PT”) and ends on July 7, 2016 at 11:59 p.m. PT. Week Three: One (1) trip for winner and three (3) guests to Los Angeles, California for the premiere of Disney Pixar’s Finding Dory. ARV: $8,000. Week Six: One (1) Friends and Family 10-pack Fandango Movie tickets. ARV: $130. Week Seven: One (1) Friends and Family 10-pack Fandango Movie tickets. ARV: $130. Boppy® Moms Night Out Sweepstakes – Win a private screening of the movie “Mother’s Day”! Win a private screening of the new movie “Mother’s Day” for you and 100 friends! ENTER SWEEPSTAKES HERE – The Boppy Company Facebook page. ENTRY LIMIT – Limit one (1) Sweepstakes entry per person per day, maximum 10 entries per person. ELIGIBILITY – The “Boppy® Moms Night Out Sweepstakes” is open only to current legal residents of the 50 United States and the District of Columbia, who are 18 years of age or older at the time of entry. SWEEPSTAKES ENTRY PERIOD – Sweepstakes Entries may be submitted beginning April 14, 2016 12:01 a.m. Mountain Time (“MT”) and ending at 11:59 p.m. MT on April 23, 2016. PRIZES – One (1) Grand Prize winner and Ten (10) Runner Up winners will be selected in a random drawing to be held on or about April 24, 2016. The drawing will be conducted by the Sponsor whose decisions are final and binding in all matters relating to this Sweepstakes. One Grand Prize winner will receive a private screening for the winner and 100 friends in a local movie theater. ARV ($2500). Each runner up winner will receive Four (4) AMC Theater green movie passes, Four (4) AMC Theater drink tickets and Four (4) AMC Theater popcorn tickets. ARV of each runner up prize: $60. 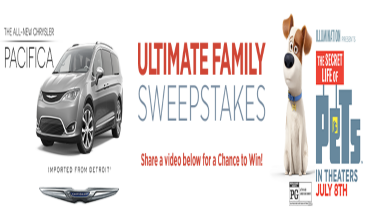 Pacifica Pets Ultimate Family Sweepstakes – Win a pair of movie tickets! Win a Fandango code for 2 movie tickets or a Secret Life of Pets prize pack (350 winners)! ENTER SWEEPSTAKES HERE – Pacifica Pets Sweepstakes page. and @SproutChannel within twenty four (24) hours of the Weekly Entry Period Start Time (the “Announcement”), and you will be required to submit a Retweet of the Announcement with the hashtag “#PacificaPetsSweepstakes” or create an original tweet with the hashtag #PacificaPetsSweepstakes and share the custom video content. 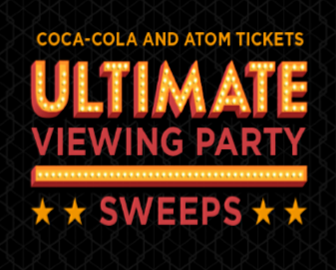 You must include “#PacificaPetsSweepstakes” in your Entry or your Entry will not be valid. ENTRY LIMIT – You may enter one (1) time per day for a maximum of forty-five (45) Entries during the entire Sweepstakes Period. ELIGIBILITY – Open only to permanent, legal United States (“U.S.”) residents who are physically residing in one (1) of the fifty (50) United States or District of Columbia (excluding Puerto Rico, Guam, the U.S. Virgin Islands and other United States territories), and who are eighteen (18) years of age or older and of the age of majority in their state of residence as of the start of the Sweepstakes Period. SWEEPSTAKES ENTRY PERIOD – The Ultimate Family Sweepstakes will begin on April 11, 2016 at 12:00 AM ET and end on May 26, 2016 at 11:59 PM ET. PRIZES – There will be three hundred and fifty (350) prizes (“Prizes”) awarded, with one (1) prize awarded to each Winner. Each Prize will consist of either: a Fandango Promotional Code valid for two movie tickets* (“Prize 1”) or The Secret Life of Pets merchandise pack (“Prize 2”). 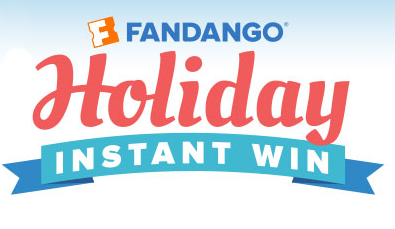 Prize 1: Each Prize 1 winner will receive a Fandango Promotional Code via email valid for two movie tickets ($14 per ticket, up to $28 total ticket and convenience fee value) to see any movie at Fandango partner theaters in the U.S. Fandango Promotional Code must be redeemed by 9/30/16. Approximate Retail Value (“ARV”): $28 USD. Prize 2: The Secret Life of Pets merchandise pack. ERV of each Prize 2 is fifteen dollars ($15).